Socktober kicks off our Winter Sock Drive. Our goal is to collect 100,000 socks to distribute to the homeless over the next few months. If you would like to collect socks at your work or school, let me know and we can arrange a pickup of the socks you collected. Every bit helps. Your donation can help us purchase new socks in bulk to distribute to our neighbors. 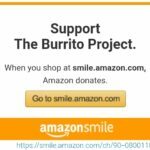 You can visit this link, of the icons below: http://theburritoproject.org/donate/ Thank you!